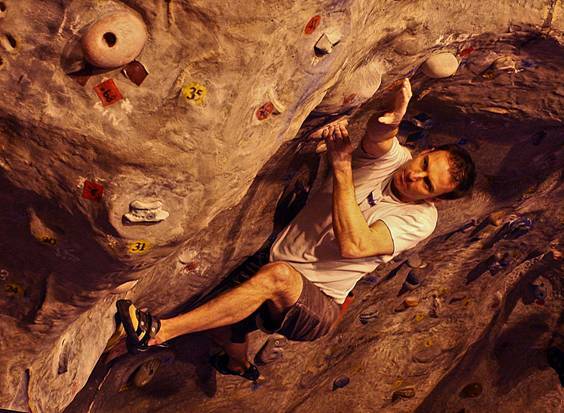 A bit of sport climbing for you. An amazing video of Black Diamond sponsored climber Adam Ondra repeating Chilam Balam (9b) and making the first ascent of La Planta de Shiva (9b) in Spain. Watch it in full screen! Life On Hold Trailer 1 from Outcrop Films on Vimeo. A short film with a bit of classic 1980's bouldering on Holmfirth Cliff. Nice to see some hard problems being done (e.g. Mad Mantle) and also some highballs, not a bouldering mat in sight!! A friend of Kirklees Climbing, Wayne North, is walking the Yorkshire Three Peaks on Sunday 01/05/11 to raise money for Action Duchenne, the charity trying to find a cure for Duchenne, a severe genetic muscle wasting disease. Members of the Land Charity’s Management Committee will be in attendance, to make a short presentation on the proposals. Residents and users will then be given the opportunity to express their opinions on the proposals. Each person will be allowed to speak for up to 5 minutes and where a group is involved, a spokesperson should be appointed. Anyone wishing to speak should give their name to Mrs Sally Barber, Secretary to the Trustee, on their arrival; she will be available from 7pm. A plan of the site will be available at the meeting. NB - This is not Cliff Recreation Ground. The purpose of the meeting is to allow the Management Committee to hear a wide variety of views on the proposals regarding the future use of this piece of land and to gather information to assist it in making decisions in the future. No decisions will be made by the Management Committee at the meeting, which will last no more than two hours. Rokt Climbing Gym opened at 10am on Saturday 2 April. After frantic weeks of preparation, with hordes of local climbers and even non-climbers queueing through the door to volunteer their help, Brighouse’s new indoor climbing venue was ready to go. Despite last minute hiccups with the mat covering, the carpet team worked 30 hours a day to meet the deadline. Walls which were bare only a couple of days previously were besieged by enthusiastic route setters. Electricians, plumbers, joiners hung from every girder, day and night. This was community spirit unrivalled. To complete the final tidy up on Friday night, a giant curry on the balmy terrace overlooking the Calder. So, get down there and try it… but remember this is only Phase 1! Photo: Euan (left) and Leigh (right) addressing the pre-opening party. 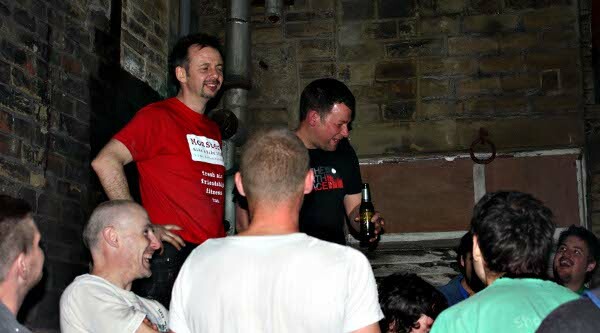 Photo: The work force letting its collective hair down on the Calder terrace. On Tuesday the first holds were bolted onto the wall at ROKT. There is still a load of work to do before opening night but at least a start has been made.